Rejection is no one's idea of fun. Not only do you have to deal with the disappointment of not getting something you hoped for, but you also have to grapple with the feelings of insecurity that come along for the ride anytime you're told, "Thanks, but no thanks." You might feel like curling up at home and never trying again after a crushing rejection, but it's best to ignore that impulse. That's because the most effective way of finding a path to your greatest success is to get rejected over and over again. One of the reasons why rejection hurts so bad is because it closes off a potential future that you were looking forward to. Whether you don't get the promotion you applied for, the college acceptance you wanted, publication of a story you wrote, or a date with the guy you've had a crush on for months, learning that the answer is no is painful because you've lost something. Overcoming the negative emotional impact of rejection is just the beginning. In addition to that, the more you put yourself out there, the more you're likely to receive acceptance that you weren't expecting. Consider what happened to writer Kiki Schirr. She set herself the goal of receiving 100 rejections in 2018. That's nearly two rejections a week, which meant she had to be putting out at least two applications or story submissions per week. With that kind of goal, Schirr decided to apply for anything and everything that interested her, even if she thought the opportunities were out of her league. Instead of racking up rejection after rejection, however, Schirr had to declare her resolution a failure as of late May, because she had gotten so many acceptances. As with any goal, you should give yourself a specific and measurable target for your rejections. 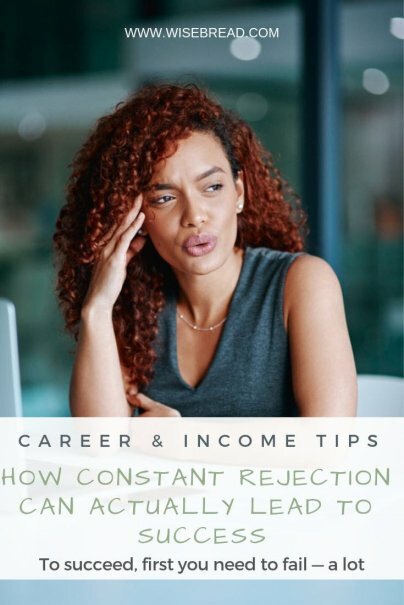 Saying, "I want to apply for more jobs and get more rejections," does not help you overcome the fear of rejection or give you something to strive for. Instead, set a goal that you will collect 30 job rejections in three months, or get turned down for 10 dates in a month. Instead of viewing each "No, thank you" that you receive as a rejection, start seeing it as an affirmation that you're trying. If you start feeling excited to receive a rejection, then you can feel good about learning from it and getting back on the horse. You can even do something fun with the rejections you receive. For instance, when Stephen King was first starting out as a writer, he sent his stories to every sci-fi and horror magazine out there. They all got rejected for the first few years, so he got in the habit of sticking the rejection letters on a nail on the wall of his bedroom, and feeling a sense of pride at the size of the stack. Job-seekers will often only apply for positions that they know they are completely qualified for. But listed qualifications are often guidelines, instead of hard-and-fast requirements, and you may find you're perfect for a job you wouldn't otherwise apply for. To succeed, first you need to fail — a lot. Rejection is just one part of failure, and but it can land a major emotional punch. Giving yourself a goal to collect rejections can help you learn to remove the sting from rejection and give you many more opportunities to succeed.